Secondary antibodies are key components of the detection system; the selection of an optimum secondary antibody can improve the positive signal in addition to reducing false positive or negative staining. Issues with species and isotype cross-reactivity are often overcome by the use of cross-adsorbed secondary antibodies. Here, unwanted cross-reactivity is removed by pre-adsorption of the secondary antibody with the cross-reacting antigen, to yield a more specific secondary and therefore reducing nonspecific background staining. Read our overview on cross-adsorbed secondary antibodies to discover why and how you should use them, how they are generated, and a list of the cross-adsorbed secondary antibodies available. 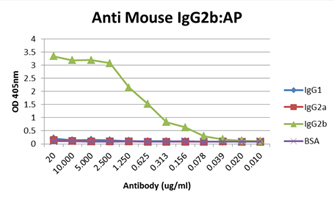 Recombinant monoclonal antibodies directed against the three main mouse isotypes, IgG1, IgG2a, and IgG2b are an alternative to cross-adsorbed secondary antibodies. They are capable of detecting individual isotypes without any species or isotype cross-reactivity, enabling multiple unlabeled mouse monoclonal antibodies to be used simultaneously. Multiplexing without species issues is therefore straightforward and an alternative species does not need to be sourced. Click here to learn more about multiplexing using secondary antibodies. Read our overview on multiplex fluorescent western blotting to discover how it can benefit you. High specificity: the signal detected by each secondary is specific to each primary. Minimum nonspecific background: isotype specific secondary antibodies do not bind to non-target IgG. Suitable for multiplexing: no binding to non-target primary antibodies in a multiplex experiment. Versatile: can be used in IHC, IF, flow cytometry, and western blotting. 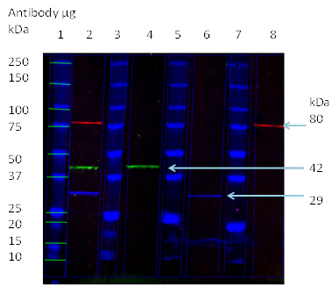 In a western blot experiment, detection of multiple targets can be achieved using isotype specific secondary antibodies, as directly labeled primary antibodies may not be bright enough. Fluorescent western blotting using isotype specific secondary antibodies. Mouse IgG1 Anti-Actin Beta (VMA00048) at 0.5 µg/ml was used in lanes 2 and 4, followed by IgG1 specific Human Anti-Mouse Dylight 488 (HCA309D488) at 0.3 µg/ml (green). Mouse IgG2a Anti-PCNA (VMA00018) at 0.5 µg/ml was used in lanes 2 and 6, followed by IgG2a specific Human Anti-Mouse Dylight 650 (HCA310D650) 0.3 µg/ml (blue). Mouse IgG2b Anti-Ezrin (VMA00344) at 0.5 µg/ml was used in lanes 2 and 8, followed by IgG2b specific Human Anti-Mouse Dylight 550 (HCA311D550) 0.3 µg/ml (red). Visualization with the ChemiDocMP Imaging System. In the five images below you can see the highly specific fluorescent staining of all three isotype specific secondary antibodies. Chromogenic staining of human colon using isotype specific secondary antibodies. FFPE human colon adenocarcinoma stained with Mouse Anti-Cytokeratin 18 (MCA1864) and Human Anti-Mouse IgG1 (HCA309HRP) (brown) and Mouse Anti-PCNA (MCA1558) and Human Anti-Mouse IgG2a HCA310AP (red). Fluorescent staining of human colon using isotype specific secondary antibodies. FFPE human colon adenocarcinoma stained with Mouse Anti-Cytokeratin 18 (MCA1864) and Human Anti-Mouse IgG1 (HCA309D488) (green) and Mouse Anti-PCNA (MCA1558) and Human Anti-Mouse IgG2a (HCA310D550) (red). Fluorescent staining of human tonsil using isotype specific secondary antibodies. FFPE human tonsil stained with Mouse Anti-Macrophages/Histiocytes (MCA1478) and Human Anti-Mouse IgG2b (HCA311D550) (red) and Mouse Anti-PCNA (MCA1558) and Human Anti-Mouse IgG2a (HCA310D650) (green). The images below show specificity of the secondary antibodies in both surface and intracellular staining. Surface staining using fluorescently conjugated secondary antibodies. 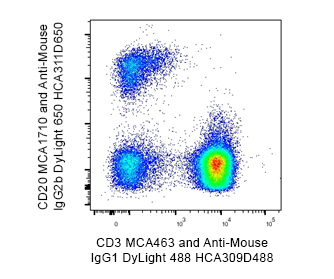 Mouse Anti-Human CD3 (MCA463) labeled with Human Anti-Mouse DyLight 488 (HCA309D488) specific for mouse primary IgG1 and Mouse Anti-Human CD20 (MCA1710) labeled with HuCAL® Anti-Mouse DyLight 650 (HCA311D650) specific for mouse primary IgG2b. All experiments performed on red cell lysed human blood gated on lymphocytes in the presence of 10% human serum. Data acquired on the ZE5 Cell Analyzer. Intracellular staining using fluorescently conjugated secondary antibodies. 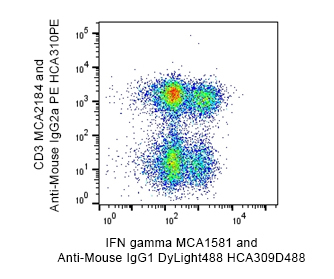 Mouse Anti-Human IFN Gamma (MCA1581) labeled with Human Anti-Mouse DyLight 488 (HCA309D488) specific for mouse primary IgG1 and Mouse Anti-Human CD3 (MCA2184) labeled with HuCAL Anti-Mouse PE (HCA310PE) specific for mouse primary IgG2a. All experiments performed on red cell lysed human blood, fixed and permeabilized with Leucoperm (BUF09), gated on lymphocytes in the presence of 10% human serum. Data acquired on the ZE5 Cell Analyzer. The isotype specific secondary antibodies are ideal for use in ELISA as illustrated in the images below, which clearly show the isotype specificity of all three antibodies. 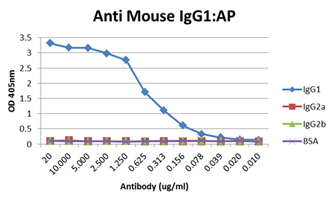 ELISA detection of IgG1 using isotype specific secondary antibodies. Mouse IgG1, IgG2a, IgG2b and BSA were used to coat duplicated rows on an ELISA plate which was then probed with Human Anti-Mouse IgG1 AP, clone AbD24121, (HCA309A) at doubling serial dilutions. HCA309A only recognizes mouse IgG1, not IgG2a or IgG2b. 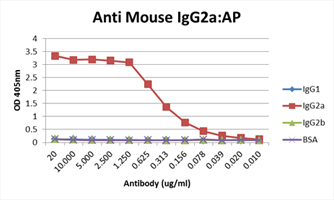 ELISA detection of IgG2a using isotype specific secondary antibodies. Mouse IgG1, IgG2a, IgG2b and BSA were used to coat duplicated rows on an ELISA plate which was then probed with Human Anti-Mouse IgG2a AP, clone AbD24124, (HCA310A) at doubling serial dilutions. HCA310A only recognizes mouse IgG2a, not IgG1 or IgG2b. ELISA detection of IgG2b using isotype specific secondary antibodies. Mouse IgG1, IgG2a, IgG2b, and BSA were used to coat duplicated rows on an ELISA plate which was then probed with Human Anti-Mouse IgG2b AP, clone AbD24127, (HCA311A) at doubling serial dilutions. HCA311A only recognizes mouse IgG2b, not IgG1 or IgG2a.